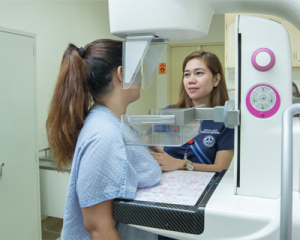 Mammogram is a radiographic examination of the breasts used to check for breast cancer in women. It is an important tool for early detection of breast cancer and assists in decreasing breast cancer deaths. Image of breast tissue is produced on a film to visualize the structures within the breasts and identify any abnormality such as cysts and tumors.